My name is Matt Winick, an Asian American from Ann Arbor, Michigan and I enjoy learning about how forensic science works, studying history, and watching different crime drama shows. The main reason I like learning forensics is to learn on how different technology can help find evidence to solve a crime, use DNA testing to help reduce sending innocent people who are accused of a crime, and evaluating different parts related to a crime scene in order to process different information. Dr. Lee, I find your work as a forensic scientist to be very inspiring to me and your approach on them on different tv shows to be very interesting to me. In Forensic Files tv show, I enjoyed seeing you be a participant on the episodes explaining your theories including working together with scientist and the police on examining evidence including witness statements on finding who committed the crime. My favorite episodes of Forensic Files that you appeared in were The “Disappearance of Helle Crafts” and “Crime of Passion Dinner and a Movie”. The main reason I liked these episodes is because I like your methods on examining the crime scene like being thorough on evaluating different evidence in the crime scene, using different technology in order to test for blood or DNA or other things to help find the killer, and emphasizing on the need to have a balance of witness statements mixed with evidence including the motive to help prove the suspect who caused the crime. 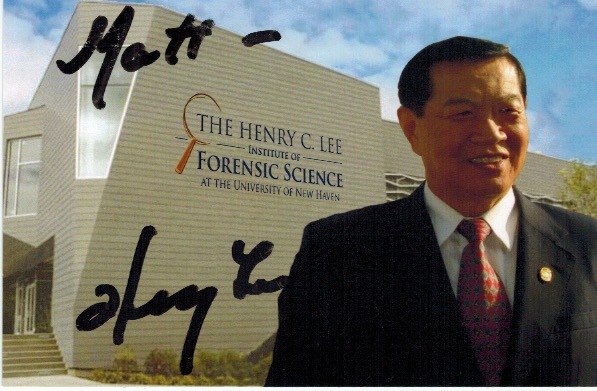 On Court TV, I enjoyed watching your tv show Trace Evidence- The Case Files of Dr. Henry Lee. In the show I really enjoyed seeing you use your forensic science consultant to work with different law enforcements to solving cases including explaining your perspective. Besides your work in forensic science, I really like on how you are a strong advocate for Civil Rights including people with disabilities’ rights, support victim’s rights, and express the need for criminal justice reform like increase funding for forensic science including DNA testing to help solve cases efficiently while reduce sending an innocent person to jail. Dr. Lee, I have Autism with a learning disability and having a disability is hard for me because I have trouble on comprehending on learning different subjects., sometimes I struggle to communicate my thoughts, and get teased. Your commitment to be a strong supporter of Civil Rights including people with disabilities’ rights really inspires me to work hard on my disability. Also your work in forensic and in different tv shows explaining about forensic science in an easy way to comprehend on understanding criminal justice reform. Your work on helping Asian American including Asian get recognize really inspires me to be proud to be an Asian American with a disability when I get teased by other Asians or Asian Americans. My letter is a gift to you for inspiring me and for May Asian Pacific American Heritage Month to help recognize Asian Americans who work hard to make a great difference for society. Your work as a forensic scientist and doing tv shows related to forensic science really inspired me to take a Intro To Criminal Justice class in Winter 2014 at Washtenaw Community College in Ann Arbor, Michigan where I got to learn about how the court system works, Miranda Rights, law enforcements, and some forensic science. My criminal justice instructor explained to me about the need for reform in the criminal justice system including a strong need for DNA testing including funding forensic science to reduce wrongful convictions, find suspects that committed the crime, and to understand why the crime was committed. I really enjoyed learning about the criminal justice and learning about the need for forensic science to fix the criminal justice system. Dr. Lee, you have made a great difference in society and in forensic science on solving cases to reduce crime efficiently. 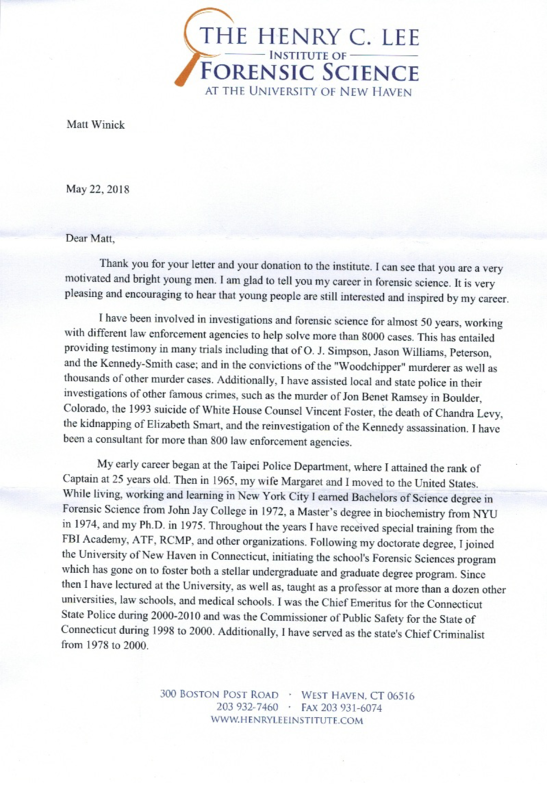 Your methods like working with law enforcement to improve relations to solve cases, use different methods on solving forensic cases, and advocating for the need for funding for forensic science including DNA testing is common sense. You have made a great impact on me to continue learning and working hard on Autism. Here is a picture of me as a gift to you for inspiring me. I was wondering if you could please share with me what it like being a forensic scientist. 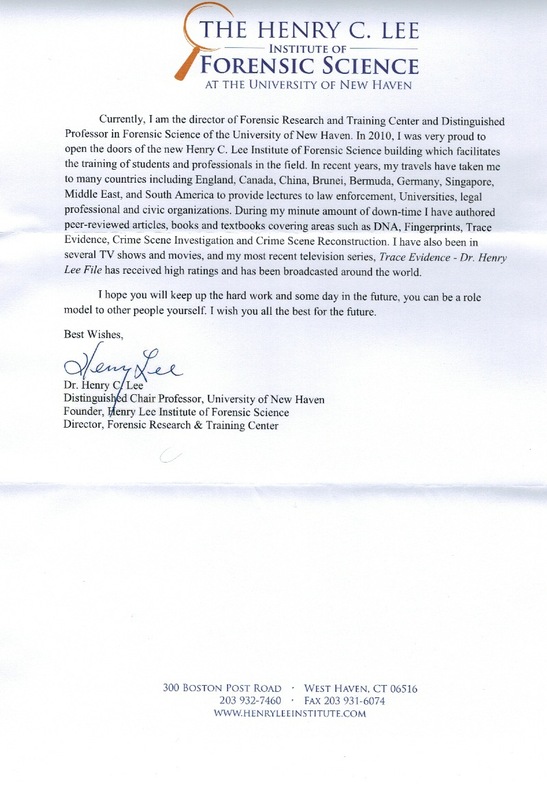 Also I hope someday I can get a chance to visit Henry C. Lee Institute of Forensic Science and get a chance to meet you because you truly inspire me. Thanks for taking the time to read my letter, working hard to make a great difference, and inspiring me.